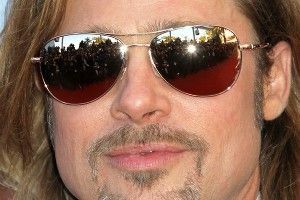 » Brad Pitt to Have Jesus Killed? Brad Pitt to Have Jesus Killed? According to Deadline, Brad Pitt is considering taking on the title role in Warner Bros.’ Pontius Pilate. Which means he’ll be playing the fellow who, reluctantly or otherwise (considering your source), sentenced Jesus to death. Things sure are gonna be awkward at Mel Gibson’s annual potato sack race this year! The movie was written by Vera Blasi, the screenwriter behind 2000’s Woman on Top and the upcoming Emperor, a WWII drama starring Tommy Lee Jones as General MacArthur and Matthew Fox as a Japanese expert advising MacArthur on what to do with the war-crimes-accused Emperor of Japan. Which means Blasi is versed in the genre of men singularly tasked with making decisions that will reverberate through history. Rather than a straight-ahead Biblical film, Blasi’s script reads almost like a Biblical era Twilight Zone episode in which a proud, capable Roman soldier gets in way over his head. His arrogance and inability to grasp the devoutness of the citizenry and its hatred for the Roman occupiers and their pagan gods lead him to make catastrophic decisions. All of this puts him in a desperate situation and in need of public approval when he is asked to decide the fate of a 33-year-old rabbi accused by religious elders of claiming he is King of the Jews.” SPOILER ALERT: The King of the Jews gets the chop. Presumably, Blasi, along with whatever director ends up coming on board, will attempt to make a movie that explores the intense pressure Pilate operated under while deciding just who this Nazareth fellow was, neither vilifying him nor pardoning him for his decision. But, even when attempting a full-fledged humanistic approach, it’s still a crazy bold move to try to pull off Pontius Pilate. If Brad Pitt does sign on, is he thinking, “I trust in the caliber of the filmmaking team, and I’m inspired by the ambition of the project”? Or is he thinking, “Come on, dudes. I’m Brad f—ing Pitt. I can do whatever the f–k I want”?